Oil magnate J. Paul Getty used some of his vast wealth to amass an incredible art and antiquities collection, first displayed in his ranch house on a bluff overlooking the Pacific. In the early 70s, he had a Romanesque villa constructed next to his house to be a permanent museum for his collection. The Malibu Villa, modeled after the partially excavated Villa dei Papiri in Italy, became the home of the J. Paul Getty Museum in 1974. In 1997, the Getty Villa was closed and the collection was relocated to the hilltop Getty Center in Brentwood (Los Angeles). 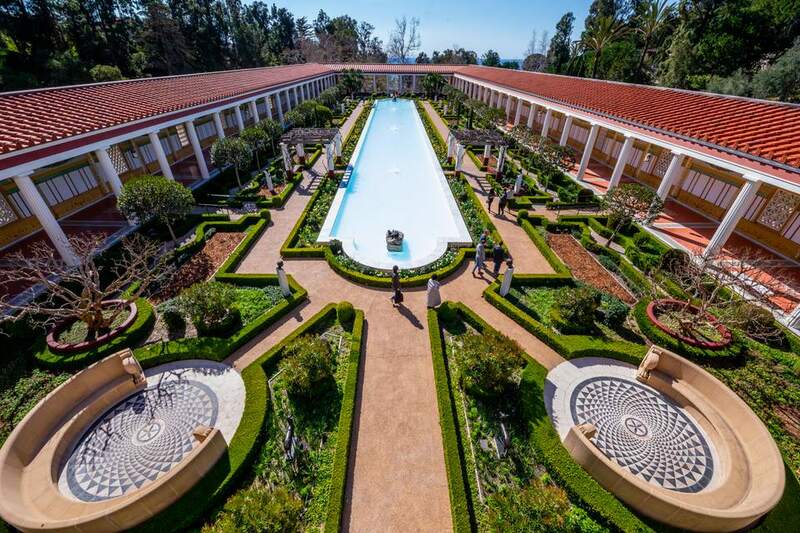 After a nine-year, $275 million renovation and expansion, the J. Paul Getty Museum at the Getty Villa re-opened in 2006 as home to the Museum’s Antiquities Collection. The Villa and gardens are familiar to those who visited in the past. The original building was stripped down to the bare framework and re-built as an earthquake-resistant, enhanced version of itself. The rest of the canyon was built up from bottom to top, covering the steep hillside with strata of wood-grained concrete and stone in a high-concept version of an archaeological dig. They also added a new parking structure, Entry Pavilion, Outdoor Theater, Auditorium, expanded Café and Museum Store in the narrow canyon. If you’re not overly obsessed with architectural accuracy, you’ll be charmed by the updated Villa, despite its cramped quarters. Use this guide to get the most out of your visit. Like the Getty Center, the Getty Villa is one of the top free things to do in LA and one of the ​top art museums in Los Angeles. Hours: Wednesday - Monday 10 am - 5 pm. Closed Tuesday and on January 1, July 4, Thanksgiving, and December 25. Cost: Admission is FREE, but advance timed tickets are required for every person over 5 years old. Each adult tickets may bring up to 3 children 15 and under in the same car. By Car: The Getty Villa is located at 17985 Pacific Coast Highway (PCH) in Pacific Palisades (Malibu), just north of the intersection with Sunset Boulevard. The Villa can only be accessed from the northbound side of PCH. By Bus: Metro Bus 434 stops in front. Accessibility: All parts of the Getty Villa compound are handicapped accessible via ramps and elevators. Standard wheelchairs and strollers are available without charge in the Entry Pavilion on a first come basis. Select materials are available in Large Print or Braille. Sign Language Interpretation is available by advance request at public events. Assisted Listening Devices are available at the Tour Meeting Point and Information Desk. The Getty Center and Getty Villa are as much about the architecture as the art collection. Like much art, they are better appreciated with an understanding of their creators’ intentions. Knowing the architects' concept of re-imagining the site as an archaeological dig, puts otherwise incongruous details in context. Oddly placed walls in the Entry Pavilion overlooking the Villa to one side and a concrete courtyard below re-create the sense of looking down into the dig pit - if you know that's what it's supposed to represent. Stairs from the garage through the Entry Pavilion and the Path to Museum bring you to the top of the Outdoor Theater, from where you can look down to the Villa Entrance. This, again, gives the impression of looking down into the site. But if you don't feel like ascending all those stairs just to climb back down through the theater, the archway to the right as you come up the stairs will take you through the Herb Garden to the Museum entrance. There are also elevators. Beyond the Villa and Outdoor Theater, between the Auditorium and the Museum Store, a flat, square pool of Chinese black marble collects water seeping from between layers of travertine, bronze, red porphyry stone and board-formed concrete to add to the archaeological concept. The different textures represent the strata of volcanic deposits that covered the Villa dei Papiri when Vesuvius erupted in A.D. 79. An Orientation Tour gives architectural highlights. J. Paul Getty modeled the Malibu Villa after the Villa dei Papiri in Herculenium near Pompeii. Only part of the villa was excavated, but from floor plans, architects were able to recreate the dimensions of the ancient Roman villa. Details of floor and wall designs come from several other Greek and Roman edifices. The Museum interior consists of 29 galleries on two levels, a reading room, and two interactive exhibits. Downstairs galleries open off an Atrium with an open skylight over a central pool. Beyond the Atrium, sculptured figures flank a long fountain amid Mediterranean plants in the Inner Peristyle, a courtyard surrounded by a columned porch. The doorway straight ahead under the yellow marble stairs leads to the East Garden. To the right of the Inner Peristyle, is the Triclinium - a fancy dining room in a 1st-century Roman villa. This space is vacant to allow you to appreciate the intricate geometric marble designs on the floor and walls and the grapevine-painted ceiling. The Triclinium opens to the Outer Peristyle and Garden with a reflecting pool running its length. Unlike the Inner Peristyle, there are no galleries behind the long porticos. Latticed openings in the mural-covered walls look through to the grounds beyond. The landscaping of the Villa includes over 1000 Mediterranean plants. From the south end of the Outer Peristyle, you can look out over the canyon to the Pacific Ocean. Another great view is from the south terrace on the Museum’s second floor. The Getty Villa houses the Museum’s antiquities collection, focusing on Greek, Roman and Etruscan artifacts. The exhibit areas are organized thematically, which allows you to compare the different styles used across time and place. For example, the Stories of the Trojan War display contains any item that made reference to Achilles, whether on an Etruscan Vase, a Roman sarcophagus or a stone likeness of the Greek hero. There is a little bit of overlap or overflow of themes. Hercules/Herakles has his own Temple and appears also in the Mythological Heroes gallery. There is a lot to see, which can lead to museum fatigue, so plan your visit to see what interests you most first. The colors, textures, and materials of the gallery spaces are designed to complement the artifacts and mimic the spaces that might have housed these items in earlier times. On the first floor off of the Triclinium are two interactive exhibit rooms. The Family Forum provides a space where children and adults can explore ancient cultures with hands-on activities. The artistically inclined can draw designs on replica vases and urns with dry-erase markers. A shadow play area allows you to grab a sword or pitcher and become a live part of the black on red vase motif. A touchy-feely display lets you reach through holes in a wall to feel what the clay for the vases would have felt like. On the other side of the Triclinium, the TimeScape exhibit helps to put the Greek, Roman and Etruscan cultures into geographical and chronological perspective. Three parallel timelines wrap around three walls. An interactive map allows you to visualize who covered what territory when. Video stations highlight stylistic differences in the representational art of the three cultures. There are also GettyGuide stations where you can use the computer directory to look up specific artifacts to learn more about them and find their location in the Museum. Upstairs on the east side of the building, there are more GettyGuide stations. You can also access the collection online to get a preview. The Café at the Getty Villa has expanded and has indoor and outdoor seating. The Café offers Mediterranean cuisine from salads, pizza, and panini to pork chops with polenta. The Espresso Cart is located near the outdoor Café seating. In addition to a variety of coffee and tea beverages, they have a limited selection of reasonably priced sandwiches, soup, salad, and baked goods. The Museum Store is located below the Café, next to the Outdoor Theater on the same level as the Museum entrance. They have typical Museum Store goods including replicas and miniatures of some of the Museum’s collection or related items, books, jewelry, souvenirs and educational games and activities for kids. Free Orientation Tours and Collection Highlights Tours leave from the Tour Meeting Spot across from the Villa entrance. Audio Tours are available at the Audio Guide Pickup near the cloakroom. There are five pre-programmed tours you can choose from. Alternately, some of the artifacts in each room are marked with a red PLAY arrow and a number that you can punch into the keypad to hear a description of the item including relevant history and myths. There are only a few numbered pieces in each gallery, so you’re left to read what you like about the rest.